Thank you for your interest in the world of Hair Art! We here at the Hair Art NETWORK pride ourselves on upholding the most rigorous standards of practice to build and improve our industry. Hair Art has played very important roles all throughout the time. And today is no less important. We are here to help embrace and project that importance by reminding the world about Hair Art and how it can be used today! 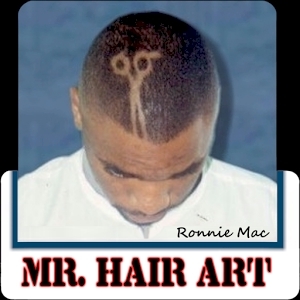 The Hair Art NETWORK was created in May of 2000 by Mr. Ronnie Mac. Mr. Mac is a Grand Master Hair Artist that has been doing Hair Art for over 25 Years. From the humble beginnings of cutting his own hair in the bathroom of his family’s home in the lower Projects of West Dallas, he continued to improve on his craft. Mr. Mac attended Texas Barber College and graduated Top of his class in 1995. He went on to work in several barber shops that year only to find that merely working in a shop was not enough for him. He wanted to own his own shop! The next year Mr. Mac found the location that would become his first in a line of many of his own Barber and Beauty Salons. Starting in a small 500 square foot rental space near Down Town Dallas, Mr. Mac worked for years improving and upgrading his location and his talents in hair. Mr. Mac continued on his personal war path of creating the “Perfect Salon”. He started searching for larger and larger spaces to acquire and convert into a B&B Salon (Barber and Beauty Salon). In 2003 he found a 7,000 square foot location in South Dallas and began his experimenting with ‘Mega Salons’… This is where you combine multiple areas of business into one. He was incorporating a Barber Shop with a Beauty Salon along with a Game Room, a Restaurant and even a GYM! When Mr. Mac saw how much room he had in these large scale buildings, it was only a matter of time until he would enter the world of Hair Shows! The Hair Art NETWORK was officially started in 2009. Several elements of the business were being worked on and prepared for in the years prior but Mr. Mac took it to the next level when he officially announced Hair Art NETWORK.com. The website combined all elements of all Mr. Mac’s businesses under one roof! From Mr. Mac’s ‘MEGA MEMBERSHIP’ (Personalized I.D. to give Discounts to Valued Customers) to ‘HHH Charity’ (Mobile Conversion Salon Buses to perform Haircuts for the Helpless and Homeless Charity). Most of all Mr. Mac valued an extension of the website called Mr. Hair Art STORE! It was because of the Hair Art STORE that many of the other areas of his business could be funded. And that brings us up to Today. As of right now Mr. Mac is preparing the biggest and most exciting events that the Hair Art Industry has ever seen, most of which is Top Secret. There are thousands of Barbers and Hair Artist enjoying one element of the Hair Art Empire. That being in the form of Hair Art Products! Mr. Mac has perfected and put on sale many Hair Art products that have now surpassed One Million Dollars and are breaking records in sales! The highest performing product in his arsenal are the infamous Hair Art STENCILS! The Hair Art STENCILS were created to assist the amature and the professional Hair Artist in creating Hair Art Designs. By placing a stencil on the head of a customer and lightly spraying the stencil with one of the Mr. Hair Art Color Sprays, you will be able to remove the Hair Art STENCIL to reveal an exact copy of that Stencil Design onto the head. Now all the Barber or Hair Artist has to do is simply follow the line and cut out the design! Thus making Hair Art Designing Easier and more Profitable! Mr. Mac has all these things and a great many more planned to launch at the beginning of 2012. Thank You for visiting our Hair Art Store! We want you to come back often to see our Daily Deal and all the new Hair Art Products that we upload weekly! Contact Us if you have any questions or concerns. Thanks again for shopping with us here at the Hair Art NETWORK Store!